1. You need to cut out sugar altogether. 2. You need carbohydrates to give you energy and provide a balance to your diet but while you are losing weight, do not eat them for dinner. 3. You need to eat fat to burn fat. Let's repeat point three: you need to eat fat to burn fat. If you don't eat fat your body thinks you are at risk of starvation and so it clings stubbornly to your own fat stores in order to see you through the period of famine. Four portions of fat is what you need whilst you are slimming. Nothing less. One quarter of an avocado, half a dozen almonds, six olives, 10 peanuts, one tablespoon of olive oil...there are plenty of choices. Nutritionists prefer unsaturated fats to saturated fats and there I differ from them as I love butter and lard but while I was slimming I included them on the list. Let's also repeat point two: you need carbohydrates in your diet and if you make sure they are complex carbohydrates (ie don't eat white carbohydrates while you are slimming) and you don't eat them for dinner you will manage your hunger well and burn fat in your sleep! Bread rolls made with whole meal flour, olives and avocado oil are delicious, filling, and will actually help you lose weight. The whole meal flour will metabolise slowly, warding off hunger and the fat in the olives and the avocado oil will fill you up and count as one portion of fat, thus warding off hunger and helping you burn fat. Perfect for a savoury breakfast or with lunch, these delicious rolls will help you diet - truly. Measure the flour into a bowl. If you are using dry yeast, make a well and add 100 g of water. Cover and leave for 15 minutes and then add the rest of the water, the oil and the salt. Knead well for 10 minutes and the pop it back in the bowl, cover, and leave for 15 minutes to rest before adding the olives. If you are using fresh yeast, crumble it into the flour, add the water, oil, and salt and knead well for 10 minutes. Pop it back in the bowl, cover, and leave for 15 minutes to rest before adding the olives. After 15 minutes, fold in the olives. Don't worry about the dough - it will recover - just be gentle so you don't squash the olives to death. You would like to see olives, not smeared brown things. Pop the dough back in the bowl, cover and leave for 1-2 hours or until it has doubled in size. Remove from the bowl and divide into little blobs about 50 grams in weight. Roll them into tight balls and pop them on a baking tray that you have lined with greaseproof paper. Cover and let rest for 45 minutes or so. Pop the buns in the oven and bake them for 18-20 minutes. They will be nice and brown on the top when they are done and sound a bit hollow when you tap their bottoms. The olives run interference to the hollow sound so don't go by that alone! Let cool completely and, when you are slimming, just eat one with your breakfast or lunch to consume a portion of carbohydrate and a portion of fat. If you are not slimming you can have more! 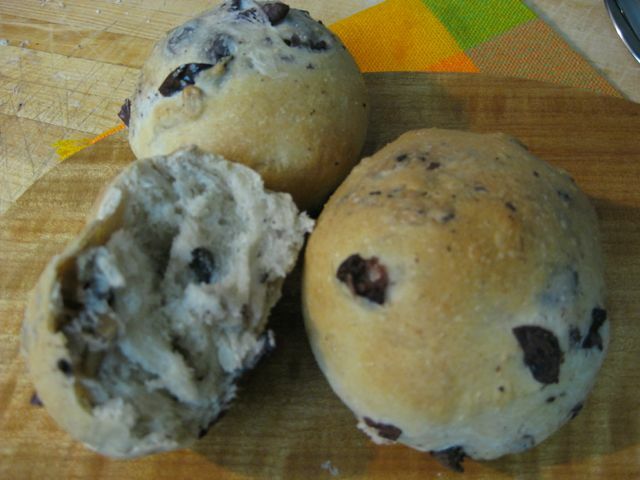 For other great bread recipes click here.